Back in 1994, between April 11 and May 14, more than 800,000 Tutsis and moderate Hutus were hacked to death in Rwanda. They were killed in their own communities, by their Hutu neighbours. In his three books on Rwanda (so far), Jean Hatzfeld, a French international journalist who has also written on the war in Croatia and Bosnia, focuses his attention on the Nyamata district of Rwanda, where some 50,000 Tutsis out of a population of 59,000 Tutsis (5 out of 6) were killed. In his first, (Life Laid Bare), Hatzfeld presents narratives by survivors. In his second, Machete Season: The Killers Speak, he listens to the killers. 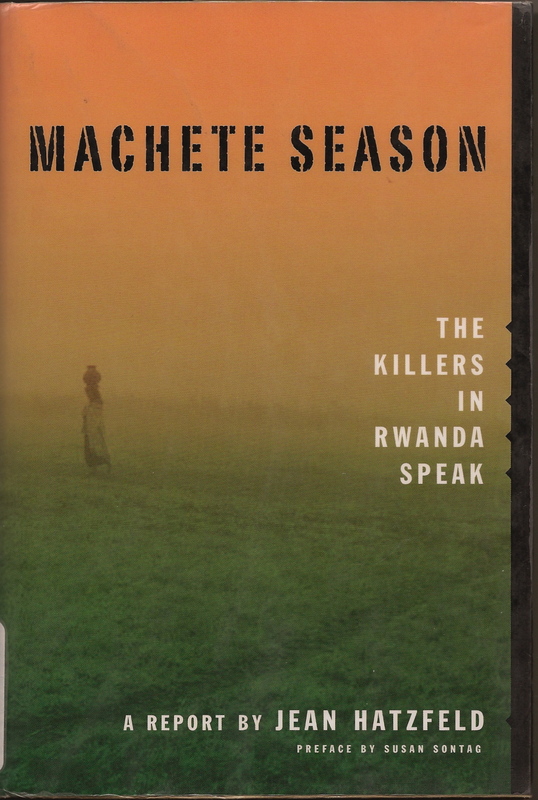 Machete Season, which I read first of the three, is a harrowing book. In the years after the genocide, the silence in the Rwandan hills was “indescribable,” Hatzfeld says, and “cannot be compared with the usual mutism in the aftermath of war.” The survivors were silent, the killers even more so. It was someone else, people would say, they saw nothing, and so on. Hatzfeld recognized that only an imprisoned killer “can or will tell his story.” And, the telling had to occur after the judicial inquiry into his case was closed and he knew what he said would not affect the decision, but also after getting his sentence, knowing he wouldn’t be confronting the outside world for some time. So, Hatzfeld interviewed a group of 10 Hutu men who were in prison for their crimes. It was difficult, he says, and his sense of distrust, his uneasiness, never abated completely. The men’s voices (unlike those of the survivors, where every conversation was unpredictable, with potential psychological blockage or changes in tone — “you had to listen with all your heart”) were flat and dispassionate. After the assassination of President Habyarimana on April 6, and news of the first killings reached the countryside, Tutsis began to flee or congregate in churches for safety. On April 14-15, some 10,000 were massacred by machete in two of the churches of the Nyamata region. Hatzfeld wrestles with the “exceptional nature” of the genocide — in the words of one of the killers, “the abnormal actions of perfectly normal people.” He also notes that the perpetrators speak more of forgiveness than the survivors do, but seem unable to put it into a context of self-examination or to imagine what forgiveness might mean for a survivor. The absolute character of their project was what allowed them to carry it out with a certain equanimity, and today this same absoluteness allows them to avoid fully undertanding and agonizing over what they did. The monstrous nature of the extermination haunts the survivors and even tortures them with guilt, whereas it exculpates and reassures the killers, perhaps protecting them from madness. In the previous post, which began this series, I urged that we enter into situations like the Rwandan genocide, in order to educate our compassion and moral understanding. But do we need to understand the killers? How do understanding and judgment work together? How close can we let ourselves get before our obligation to the victims and survivors is compromised? These were questions that troubled me as I began this book, and seem to have troubled Hatzfeld as well. I don’t think I’m much closer to answering them, except to note my reactions as I proceeded through the book. I did gain understanding, yes, and even a certain amount of compassion for the perpetrators, at least as far as their sense of having been caught up in something bigger than themselves and their insistence that it was “kill or be killed.” I was astonished too at how articulate and “moving,” almost poetic, their descriptions of things could be. I found their words gripping, and the book hard to put down. But the ultimate effect, in fact, was perhaps not quite what they might have expected. Their words enlarged my sense of what the victims had endured and increased my understanding of the survivors’ pain. Although I began with a certain reserve, it was the killers, in fact, who, through their words, distanced themselves from me. This entry was posted in Books, Death, History and tagged Hutus, Jean Hatzfeld, Machete Season, Rwandan genocide, Tutsis by doradueck. Bookmark the permalink.